Hi there! Welcome to all things Pool noodles. You are going to be quite surprised to see all these fabulous ideas you can create with just a one dollar pool noodle! I tried to think outside the box on this one, but came up short. a traditional pool noodle wreath. Certainly adds color and whimsy to the porch. A little burlap, stencil and some cute button embellishments. I bought three rolls of green polka dot ribbon from Walmart. Check out my ivy this summer! They are growing like crazy out there! ENJOY the 40+ ways to use your noodle! Where the heck was I? I would have loved to do this! What a great fun IDEA! Your noodle wreath is adorable. I love the your little pennant flag! So pretty! Thank you for putting me on your blogroll. I did the same! Let’s visit more often!!!!! Then, I will KNOW when you have a super fun linky and I can join in! If you would just turn that little pennant upside down, it would be a “W” and I could put it on my wreath! Hehe! 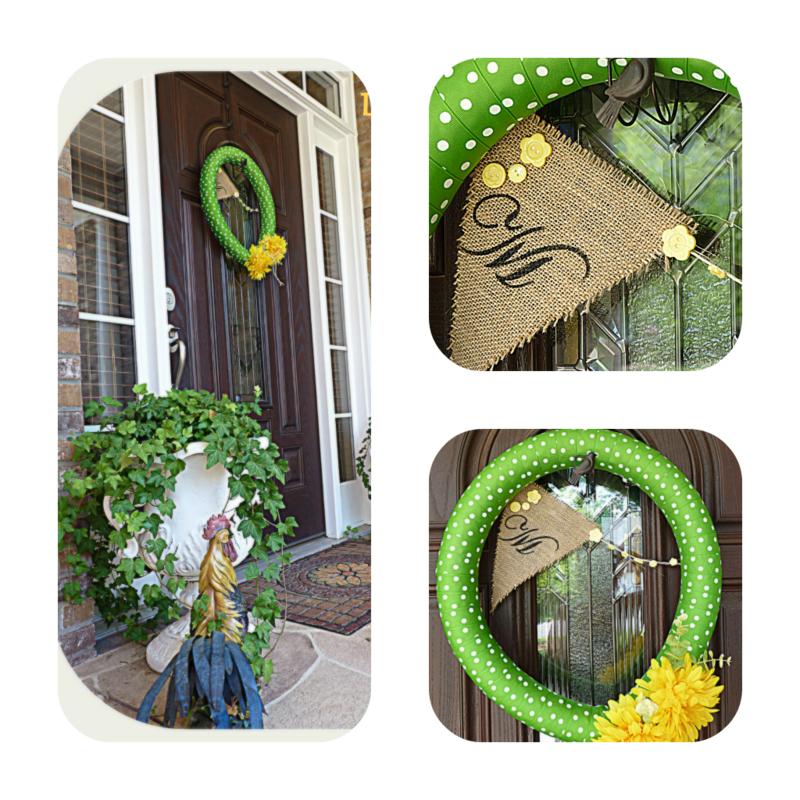 Hi Debbie, Your wreath is so cute,love the burlap pennant and adorable polka dot ribbon. I linked up but I don’t know where my link went. I’ll check back later. Thanks for hosting. Oh it just popped in, never mind LOL. I love it, Debbie. It’s so bright & colorful & it really pops on your door! I tried thinking outside the box too, but it just wasn’t meant to be, no matter what I tried! Oh that ivy is beautiful! Loving your GREEN wreath! So fresh and pretty. I got glimpse on your porch post and just knew I would love it!! How cute Debbie! I LOVE the green polka dot ribbon!! So summery! I love it. The green ribbon is perfect. The wreaths are a lot of fun. I use mine at the pool….I wonder if hubby would miss his! heehee! Oh what a fun party, Debbie, & thanks so much for hosting. 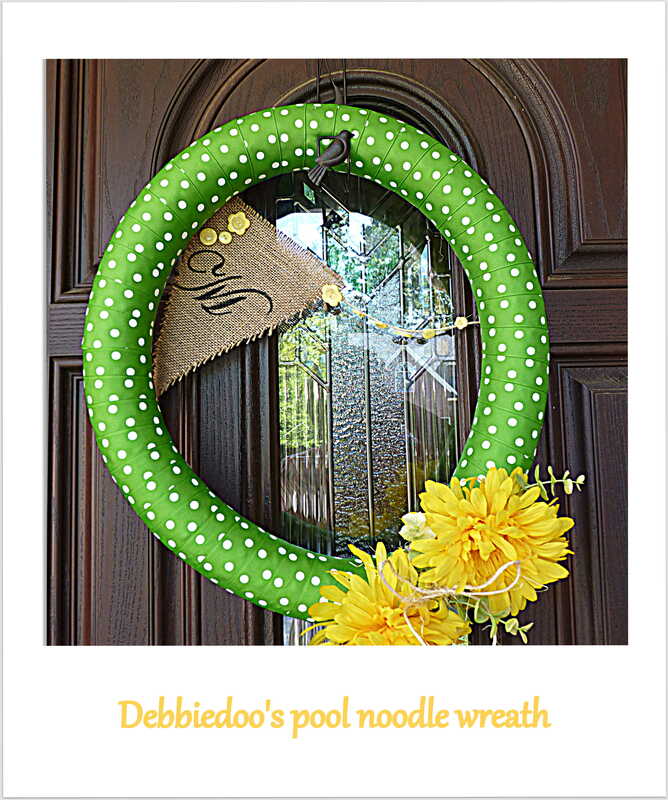 Your noodle wreath is fabulous — I love the green & white polka dots! It’s just perfect for summer. Debbie your noodle is gorgeous! Love those polka dots! What an outrageous fun party. I really like the green polka dots…polka dots always remind me of Parisian style dresses! Love, love the green with the yellow! I’m on a yellow kick for some reason this year. Love your noodle wreath! Those colors just scream summer to me. Bright and cheery! Great job, my friend! 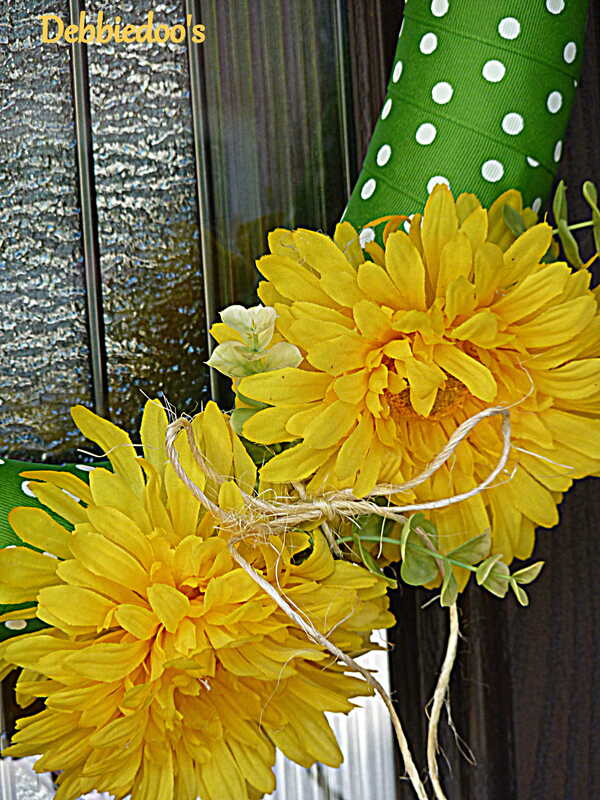 LOVE the green polka dots – what a fun wreath!! You girls know how to throw a party – wish I had used my noodle! I love it and would copy it in an instant. In fact, I’d like that look for later in the summer. I love the monogrammed part. That looks fabulous. I really enjoyed doing this, Debbie. I’m so glad you all had the inspiration. Love, love, love it!!! You must have used a ton of ribbon!!! I contemplated using ribbon, but it made my heart race to think of using an entire spool…I do love my ribbon. I did have a lovely time trying to wrestle the pool noodle and duck tape…good news, I won! So cute, Debbie Dear. I’ve been so busy lately and not playing in any parties! Waaa! This makes me want to play again. What a cute wreath Debbie! I have been so out of touch with blogland lately. If I would have known about your party I would have bought myself a noodle and jumped right in! There sure are some great ideas! That is so darn cute! I LOVE the colors too!!!! Love your wreath. The green and white polka dots are so great for summer. I need to try one of these, it would certainly be cheaper than buying a wreath form. Your wreath is really cute Debbie. It’s a bright and colorful addition to your porch. What a fun and great idea!!! I would have never thought of this. I will now never look at a noodle as just a floaty for the swimming pool. Are you sure there is noodle under that wreath and not the resurrected ever painted grapevine wreath? You trying to fool us? 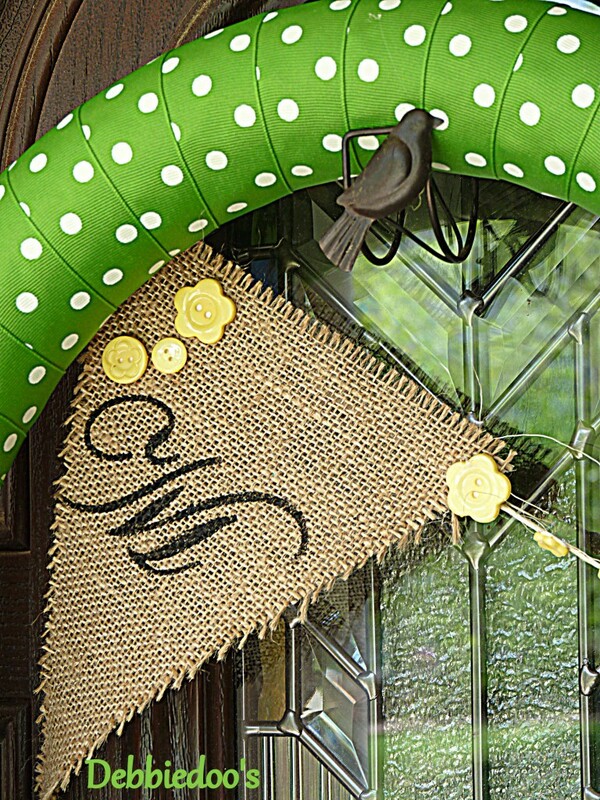 Your wreath is very cute…love the colors and the burlap just sets it off! It matches your new look of your blog too! It’s amazing what you can create if you just use the Ole’ noodle! Some really cute ideas! Debbie, yours came out so CUTE! I’ve been wracking my brain for a pool noodle ideas!! I hope I can come up with something!! Anyway it’s fun to look at them all. Great party!! Love…..the color of the wreath makes me happy. These are all so cute. I wish I had the patience, or even the vision to make one. So out of my range, but I am loving all the different interpretations of them! What a cute wreath! I can’t believe I saw this party, and I just happened to do a table using a noodle! I had no idea this craft party was taking place! Thanks for hosting! Have a great summer! You parties are always so fun! 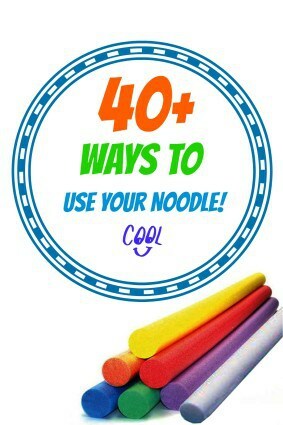 I have had a blast looking through all the great use your noodle ideas. I missed out on this one but I’ve already got an idea for you next magazine copy cat challenge so I hope you will do another one. You do have such a gorgeous front porch, Debbie, and I love that black standing fan you have there..Breeze…I can feel the breeze sitting there 🙂 Enjoy your weekend! Great Party Debbie! I love playing with you =) Since It’s almost closed out. I think I’ll add my other two noodles 😉 Just for the heck of it!! You forgot my kids favorite race the marble game made with pool noodles sliced the long way. Put two next to each other and two kids can race marbles! Even works to entertain one child! OH wow..that sounds fun. Thanks for sharing. I’ve used them to store bracelets. Fit in crumpling boots to stand up. Cut smaller for child in tub. Around a rose bush to stand up. Or any small tree. Handle bars on bike. Those are brilliant ideas! Thanks for sharing Kay.